PRICED FROM �995 TO �,615, the new Aveo comes with a number of engine options: 1.2 (84bhp) and 1.4 (98bhp) petrol along with a 73bhp 1.3-litre turbodiesel with CO2 emissions of 99g/km as well as a 93bhp Eco version (with 95g/km) and another 93bhp unit emitting 108g/km. Trim and equipment levels number three: LS, LT and LTZ. At present, advance orders for the Aveo show an equal preference for all the engine options. However, it does look as if the 84bhp 1.2-litre petrol engine in LT specification will prove to be the single best-selling version. The 98bhp 1.4 in the top LTZ trim is also the focus of strong interest by more mature couples, perhaps because this engine offers the option of an automatic transmission. Business users and high-mileage private motorists will go for the Eco spec 93bhp diesel unit  its 95g/km emissions make it both road tax free and London Congestion charge exempt. There's also a low-ish 13% company car tax for all three diesel versions. That noted, company car users should not overlook the petrol engines because the 1.2-litre unit is rated even lower  at 10% BIK; the 1.4 petrol incurs 15%. As usual, the choice between petrol and diesel power in small cars is the comparison in purchase price versus running costs. For example, the likely best-selling 84bhp 1.2 LT petrol model costs �,995; the best-selling diesel model  the 93bhp 1.3 Eco LT  costs �,795. Each has their merits but the �800 premium for the diesel is a lot to claw back in taxes and slightly better economy. And, as is always the case, it will come down to personal preference and circumstances. The diesel unit, for me, proved its worth by just being nicer and more responsive to drive  the impressive 67.3mpg during my test drive was the icing on the cake (officially, the Combined Cycle fuel consumption is given as 78.4mpg). Over the same test route the 1.2-litre petrol model managed 45.6mpg (official figure: 60.9mpg) while the 1.4 petrol returned a real-life 41.8mpg (officially 53.3mpg). Insurance costs vary little between models, with most falling into Groups 5, 6 or 7. The 93bhp diesel is 9E in Eco form and 10E in LTZ spec  still very competitive. 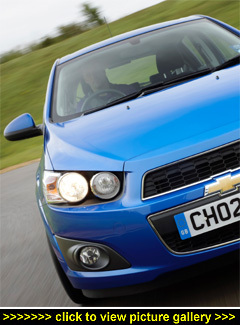 The all-new Aveo builds on Chevrolet's reputation for delivering great value for money. However, today's financially-constrained motorists are already looking for value but they also want something that looks good as well. They won't be disappointed by the Aveo's kerb appeal  it's different from the other feline-eyed, rounded shape superminis that currently dominate this sector. Flanking the Aveo's scaled-down Chevy grille are twin headlights; and its sculptured wedge-shaped side profile provides a sharper look than most of the 'moulded' styling now commonplace in this segment. And although the Aveo is a five-door hatchback, the handles of the rear side doors are discreetly placed in the window surround, making it look more like a sporty three-door. The wheel-at-each-corner design not only looks good but also ensures maximum use of the interior space  two adults and two grown-up children will be happy with the room on offer. Boot/load space is a usable 290/653 litres. And although Aveo prices are competitive, the cabin is trimmed with relatively good quality materials; and they look durable. Even in basic spec, the Aveo is kitted out with AirCon, CD/radio, power heated door mirrors and electric front windows, cruise control, remote locking and a rear spoiler. The best-selling midrange LT trim adds more: a four-way, power-adjustable driver's seat, Driver Information Centre, Bluetooth compatibility with music streaming, steering wheel-mounted audio controls, sunglasses holder, chrome gear knob surround and 15-inch alloy wheels. Additionally, the top LTZ trim has features that owners will happily pay more for, including rear parking sensors, six speakers, automatic headlamps, leather-wrapped steering wheel and front fog lamps. For extra peace of mind, all Aveo models are backed by a five-year warranty. Both new free-revving petrol engines are responsive providing they're kept in their optimum powerband  both run out of steam climbing steep hills but they cruise without stress on most roads and are neat and nimble around town. Of the two, I think the 84bhp 1.2 is the best choice: it's cheaper, more economical and virtually as fast as the 98bhp 1.4. That said, for me the clear best engine choice would be the 93bhp 1.3 Eco 95g/km model. Yes, it does cost more to buy but it gives more in return. It's no ball of fire but it is noticeably more responsive and flexible to drive, impressively quiet except when really pushed and very light on fuel. And while the Aveo doesn't beat the driving dynamics of the Ford Fiesta, Vauxhall Corsa or the Renault Clio, it has price and kit on its side  along with its appealing and distinctive looks. Against? Some body lean during cornering, a jittery ride over poorer road surfaces, and a lack of feedback through the steering. However, on the plus side you get value for money with a good specification, low running costs and distinctive styling and comfort.